Adopted in April 5, 1979. Approved by the governor on April 5, 1979, a bill introduced by Sen. Maurice Kremer of Aurora adopted the official state soil: soils of the Holdrege series, classified as Typic Arguistolls, fine-silty, mixed, mesic. 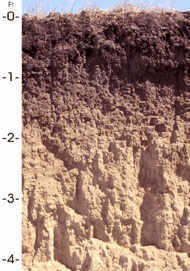 Soils in the Holdrege series are recognized by features of their "profile" (created by horizontal layers) that are the result of the prairie environment. They are suggestive of soils formed under mixed grasses, in a climate where moisture stress is common, but where enough movement of water through the profile has resulted in downward movement of clays and lime. These processes have led to a soil with a thick, dark colored topsoil, a clay enriched subsoil and a substratum that contains free lime. Holdrege soils are among the most extensively cultivated soils in the state. 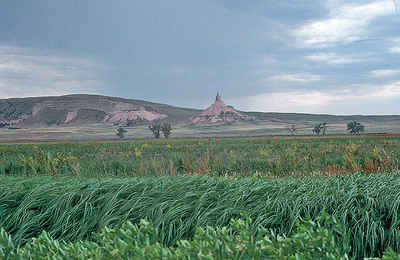 Presently, nearly all Holdrege soils are cultivated. A very large part is irrigated. Corn and grain sorghum are the principal row crops. Winter wheat is the most commonly grown small grain. Their natural fertility, desirable tilth, and the landscape on which they exist join with irrigation water and the skillful management of Nebraska farms to provide a valuable agricultural resource. Holdrege soils are extensive, making up about 1.8 million acres in south-central Nebraska. 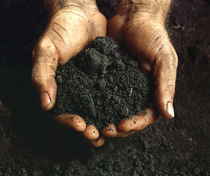 Most areas of these soils are used for crops, pasture, or rangeland. Corn, soybeans, and small grain are the main crops grown under dryland conditions. Many areas are irrigated. The Holdrege series consists of deep, nearly level to gently sloping, well-drained soils on uplands. These soils formed in silty, calcareous loess. Slopes typically range from 0 to 6 percent, but they are as much as 15 percent in some areas. The average annual precipitation is about 22 inches, and the annual average snowfall is about 22 inches. The average annual air temperature is about 50 degrees. The Holdrege series was established in Phelps County, Nebraska, in 1917. it is named after a community in the county. 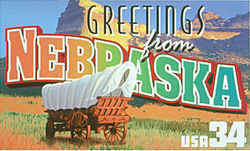 It was selected as the Nebraska State soil in 1979. Holdrege soils are well drained, but will hold between 10 and 11 inches (25.4-28 cm) of water available to the plants within a 5 foot (150 cm) depth. The Holdrege series consists of very deep, well drained, moderately permeable soils formed in calcareous loess. These upland soils have slopes ranging from 0 to 15 percent. Mean annual temperature is about 54 degrees F, and mean annual precipitation is about 23 inches at the type location. SERIES ESTABLISHED: Phelps County, Nebraska, 1917.